The Cherokee has changed significantly since it was first released for sale in the United States in 1974. In fact, the fifth generation of the Cherokee was released in 2014, and this generation transformed the smaller SUV into a roomier midsize crossover. This is the ideal SUV choice for drivers in Boulder Colorado and surrounding areas who are looking for a vehicle that is perfectly classy and comfortable for commuting and running around town in. It is likewise ideal for drivers who want a rugged, dependable vehicle that is capable for off-road adventures. When you visit our Boulder dealer, you will see what the 2018 Jeep Cherokee may be one of the few vehicles that lives up to all of your expectations. When you stop by our Boulder dealer to pick out the specific Cherokee that you want to take home, you will notice that you have nine exterior colors to choose from. The exterior of the current model year has a body-colored grille and door handles, a curved front bumper and gentle contouring throughout the hood and side panels. The lowest trim level comes with 17 x 7-inch alloy wheels, and the higher trim levels come with 18 x 7-inch painted alloy wheels. All-season tires are standard with all 2018 Cherokee trims. A power fixed sunroof is an option with some trim levels. There are also more than a dozen optional packages available upon request that add different combinations of features to the exterior for improved style and functionality. Before you stop by Pollard Jeep soon to test drive the new Cherokee, you may be wondering what to expect when you get behind the wheel. The Cherokee may be rugged and reliable in adventurous situations, but it also has all of the sophisticated comfort and convenience features that you want access to on a daily basis. You will find that this spacious vehicle has room for five adults with standard cloth seats available in up to four color options depending on the trim level that you select. Manual front seat adjustments are standard, and power-adjustable leather seats are available as standard equipment in higher trim levels. The rear row has a split-folding design that expands the already spacious cargo area with ease. 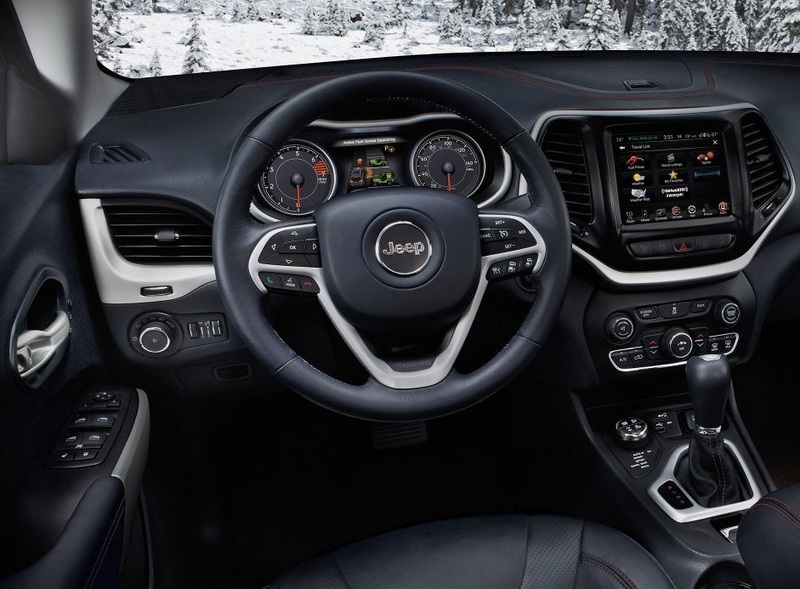 Some of the many standard interior features in the Cherokee include a quality stereo system, a memory card slot, USB connections, auxiliary audio input ports, a decked-out instrumentation panel, heated side mirrors, audio and cruise control functions on the steering wheel, a backup camera and other thoughtful features. Higher trim levels also include standard features like power windows and door locks, heated front seats, keyless ignition, rear sensors, a universal remote, a leather and alloy steering wheel with a heated element, climate control and more. Nine speakers with a subwoofer, Uconnect navigation and SiriusXM satellite radio are available as interior options upon request. When you stop by Pollard Jeep to get to know more about what the 2018 Cherokee offers, you can look under the hood to admire the exceptional engineering that this Jeep model is known for. The base engine for the Cherokee is a 2.4-liter, inline four engine that uses flex-fuel. This 16-valve engine offers 171 foot-pounds torque and 184 horsepower. A nine-speed shiftable auto transmission is standard for all 2018 trim levels, and you will benefit from either a four-wheel drive or a front-wheel drive option based on the trim level that you purchase. The 2018 Jeep Cherokee also comes with on-demand four-wheel drive, automatic locking hubs, an enhanced suspension system and hi-lo gear selection with some trim levels. The best way to experience the power and capabilities of the Cherokee in Boulder Colorado is to take the vehicle out for a drive at our local dealership. Regardless of whether you intend to drive your new Cherokee mostly in Boulder Colorado or you want to take you off-road from time to time, you need it to perform well and to keep you and your passengers safe and secure. Some of the many safety features that you will find as standard equipment in this Jeep model include an engine immobilizer, Xenon dusk-sensing headlights, a tire pressure monitoring system, auto-delay off headlights, several headrests, child seat anchors in the back row, daytime running lights, a post collision safety feature, multiple airbags, fog or front driving lights, traction control, stability functionality, four-wheel ABS and more. Some of the standard features that are only available in advanced trim levels for 2018 are turn signals in the side mirrors, a remote anti-theft alarm system and a blind spot warning with an accident avoidance feature. You can see that the Cherokee for 2018 may have all of the features that you are looking for as well as the refined, classic style that you prefer. At Pollard Jeep, we are your trusted Boulder dealer that is dedicated to your satisfaction throughout the sales process and long after you take ownership of your new Cherokee. We want to help you make a thoughtful SUV selection, and our sales team is ready to assist you every step of the way. To request an appointment with our sales team, call us today. You can also stop by the dealership at your convenience to get behind the wheel of the new Cherokee.